Who makes this hood?? I must have one!!! Last edited by 2006.350ZR; 03-06-2009 at 09:04 AM. what's the name of the hood and can I order it through you? I only helped because you have an 06 ZR. Yes, we offer it for sale. How about those headlights? Do you offer those as well? They look similar to the m45 (I believe) lights. he did a custom job, those are Q45 projectors. his car is bad ***. I like the design ! I love that hood, I wish I could trade my liver for it. 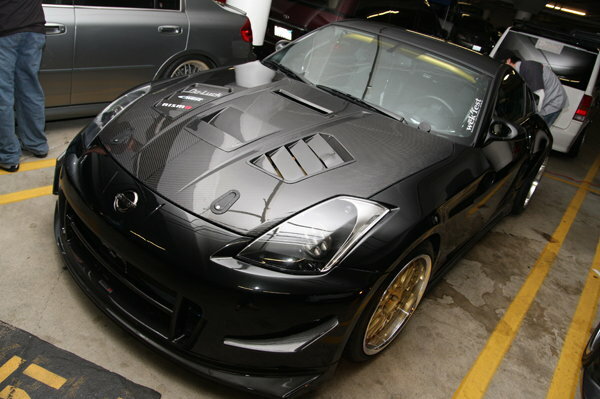 The FRP is reasonable for an extremely high quality hood, but the CF...holy crap!!! MSRP's for over $2,000 I believe, it's double the cost of the fiberglass. but look at that weave... you show me a replica hood with a weave like that. beauty. you pay for what you get. yup, i remember when eric ordered the hood. it's a beaut! Oh for suuuuuuure! C-West does quality...no doubt about that. Sorry if my post implied that I thought it was a rip-off.